My gaze wandered over to the skinny girl with pearly white skin. Her hair was tied back in a sleek ponytail, and her face resembled a rabbit’s. “Who is she?” I wondered, “I have never seen her before….Let’s see how fast she is!” Grinning, I bolted for her. Eyes wide with bewilderment, she dashed away from me. At that time, I had no idea what this game of tag would mean to me. I also did not expect this girl to become such an important part of my life. Raising an eyebrow, I shuffled into my sixth grade homeroom on the first day of school with my best friend Tina. We were the first ones there. A few minutes later, I stared with interest at the pale girl who was walking into the classroom. It was the same girl who had joined us for a game of tag. Apparently, her name was Olivia. Olivia and I know each other only because we were both Tina’s close friends. Since we were both in the same homeroom and rode the bus home, we would work on homework together every eighth period and then stride to the bus together. Along with Tina, we would be chatting about something, and I would offer a comment. Typically, Olivia would respond with, “Are you an idiot?” or “You’re so slow,”, which is the last thing friends should normally say to one another. I knew I was intelligent, because my scores were among the highest in my grade and because other people sometimes asked me for help with homework. Therefore, although annoyed and shocked by her words, I chose to take them lightly. I tolerated her negative statements, and continued to befriend her, because strangely, some part of me was attracted by her unconventional behavior. Her bizarre personality caused my initial friendship with her to be just as unusual. Honestly, I had a hunch that she continued to befriend me at that time only because she thought I was some submissive kid who did whatever was asked. I was indeed that obedient, however. Our relationship was like that of a master and a slave. When we two were heading to lunch or going somewhere else, she frequently asked me to carry her books or her bag. I agreed without protest every time, even though my shoulders sometimes hurt from the weight of lugging her stuff on top of my own. The average person may find my degree of tolerance incomprehensible, and I do not disagree with that. Perhaps I was fascinated by her airs, by the way she spoke, by how she walked, and decided I would do anything I could to know her better. I desired the key to unlock the door to her heart. I wanted to penetrate the core of her being, decipher her code, and understand why she functioned this way. Anyway, it was not as if being her slave was all about the work. She revealed her interest and skill in playing yoyos to me. Olivia had learned all types of tricks from watching videos and demonstrated to me every single one of them. One day during recess, she beckoned me to follow her to the middle school lobby area. As Olivia released her yoyo, a buzzing sound broke the silence. Straightening the neon green string, she tugged a segment close to the yoyo and flicked the sky blue yoyo one, two, and three times towards the upper part of the string. “Ants climbing up a tree,” she sang, “That is the name of the trick.” I nodded and continued staring intently at the yoyo as Olivia displayed other tricks. It was an enjoyment to be the only witness of such a unique and rarely seen performance. I became even more drawn to this girl. Fortunately, by next year Olivia began treating me more nicely. Although we were two girls, I perceived us as “brothers.” We developed our very own handshake, comprised of slapping one another’s palms, bumping fists, and finishing with a twirl. It was designed to be special and elaborate because we did not welcome other people to copy us. That handshake, which we performed several times a day at school, proved the strength of our friendship, which I was rather pleased about. Olivia also opted to have me be her pupil and call her “teacher”, which I happily agreed to, because she volunteered to teach me some socializing skills, which I lacked. One day during recess Olivia and I sat in a dim corner of the stairs near the library. Olivia announced, “You know, Gracier, you should not leave your mouth open when you roam around school. You should zip your mouth and maintain a slight smile as you saunter down the hallways, because that makes you appear to be friendly and sociable.” Looking at the floor, I considered her suggestion for a while in silence. I had no problem with the “keep my mouth tightly shut” part, but I was uncomfortable with plastering on a permanent smile. I did not enjoy forcing myself to wear a particular expression. However, I decided to take her advice and try it anyway, so I looked straight at Olivia, smiled, and answered, “Okay. Thanks, sensei.” She grinned, and we walked with a spring in our steps down the hallway towards our next class. And so I stuck to Olivia as if I was glued to her. The truth was, I did not have other close friends. I also started caring for her, scolding her for sleeping too late and skipping breakfast, because I did not like how she was damaging her health. She was appreciative of my concerns, and became a friend who always had my back. I had cried in front of her twice, and she was always gentle and supportive. My fondness for her lasted all the way to ninth grade, when she suddenly drew away. She had warned me in the summer that she would attempt to make new friends, but I did not expect her to suddenly not talk to me at all. The first few days she was absent at the lunch table, I felt extremely lonely, because I was used to seeing her every day at lunch. I also hardly saw her the rest of the day, because we only had one common class, biology during sixth period. “It is alright,” I told myself, “I’ll get used to it soon.” However, although I had become close with another friend, I still felt as if something was missing. Several days later I decided I should just tell Olivia how I felt. Taking a deep breath, I opened up skype and left her a long message. Then, I proceeded to do my homework, but I had a hard time concentrating. A few minutes later, I heard the sound of an incoming message. My response, when I think about it now, was somewhat unusual. I bolted for the computer the moment I heard the sound. When I saw that the message was from Olivia, I was as excited as if I had won the lottery. After reading her reply, the floodgates opened and tears of relief gushed from my eyes. I cried. I poured out all the sorrow I had been feeling and then laughed with tears of joy. It was as if I had gone mad. All Olivia did was apologize, joke that I sounded as if I was “in love” with her, and promise she would make sure to eat lunch with me once in a while. So, why was I so emotional as if I had finally taken back my true love? After calming down, I realized that it was because I seriously valued my friendship with Olivia. Olivia’s importance to me was fully understood at that moment. The next day Olivia sat next to me at lunch and flashed me a knowing grin. The corners of my mouth curved to a height not reached in quite a while, and my head felt warm and giddy. I felt as if I had finally seen the light after being in the darkness for a long time. From that point on, Olivia and I were back to normal. We did not stick together all the time as we did the previous year, but we still often hung out. We joined the badminton team together and had a blast staying after-school and playing our favorite sport as teammates. I also became Olivia’s teacher, helping her comprehend biological concepts and quizzing her before we had a test or a quiz. I was satisfied, and hoped our close relationship could last all the way until we graduated high school. Therefore, it was totally unexpected when Olivia told me during the last few months of the school year that she was transferring to Concordia. For a while my mind went blank, but then at first I did not think it was that big of a deal. She was still in Shanghai, anyway. We could play together during the holidays just like usual. I knew I was only comforting myself though. Regret soon hit me like a ton of bricks. If I had known earlier, I would have switched to the four thirty bus at the beginning of the year so that I could spend an extra hour with her every day. We only ran into each other during lunch and during sixth period biology, so we seriously had quite little time together. If I had heard sooner, I would have agreed to be her science fair partner without hesitation. If I had known earlier, I would played with her more often during the winter vacation. If I had…. Unfortunately, time cannot be reversed. Thus, from that point on, I treasured every moment with Olivia. We were happiest experiencing life together; we were unsatisfied by the idea of only occasionally meeting up to participate in a particular activity. Surviving school by motivating each other was the basis of our friendship, and as I knew our friendship could change after Olivia left, I tightly grasped onto the remaining opportunities I had to spend time with her. I will always remember the last field trip we took together. That year, our school brought us to a forest park on a sunny, cloudless day. It was springtime, so nature was in full bloom. Olivia and I arrived at the park’s gate in different school buses, but we later found each other as well as our other friends. “Let’s go!” we all yelled, and took off jogging. We slowed into a stroll as we approached a long, straight pathway lined with yellow flowers. Olivia looped her arm through mine and we began walking happily down the road. Suddenly, Olivia screamed, clutched my arm more tightly, and hid behind my back. I glanced around, chuckled, and shook my head. It was a white butterfly. Master Olivia was afraid of a tiny insect; yes, it was that ridiculous. The first time I learned about this fear of hers, my eyes widened with disbelief and my body shook with the laughter I sought to suppress, but at that moment, pleasure was the only thing I felt. I was busy feeling content about the fact that because of the butterfly, Olivia was so dependent on me and clung so close to me the whole time through the road. Connie, who was a little behind us, teased us, “Guys, look! They’re like a couple!” Her statement further increased my degree of satisfaction. The rest of the day Olivia and I broke off from our group of friends, and the two of us rode on almost all the amusement park rides. While we waited in line, we played special hand games only the two of us knew. Explosions of laughter often occurred, especially when Olivia hit me or glared at me jokingly after she lost. Her expression and reactions after losing one round were so hilarious I could not help but be amused. At the same time however, I felt a little sad as I realized that there was no other person on Earth who could bring me so much joy so easily. Yet this person was about to disappear from my side. The remaining days flew by quickly, and very soon it was time to sign yearbooks. We left each other page long messages. Olivia wrote her message with sincerity and heart, and expressed her feelings for me just as I did for her. The most significant part of the message was: “When I’m gone, meet new best friends, come on! I believe in you. Go talk to people. Get loads of fun!” When I first read it, I felt thankful. I was grateful for having such an encouraging and optimistic friend. I had little idea of how much the messages would motivate me later on, though. After the school year ended, I wept for the loss of a dear friend. A while later, I went into my room, pulled out the thick, hardcover, gray yearbook, and reread Olivia’s message. “Meet new best friends…..I believe in you.” Tears started streaming down my face again. “No one will be just like you….” I whispered. I also knew that I had never really tried making new friends before. Since I was shy, I had always waited for people to talk to me first. Thus, I felt scared. I had a feeling that I would need to find a new best friend next year but would be unable to do so. Summer vacation commenced and passed. Tenth grade began. Because I had other good friends, I was not that lonely without Olivia around. However, I could not escape the fact that I had less and less friends as more people left the school. I realized that I needed to challenge myself and go speak to people, regardless of whether I needed a best friend or not. And so one night I read Olivia’s message again to motivate myself. 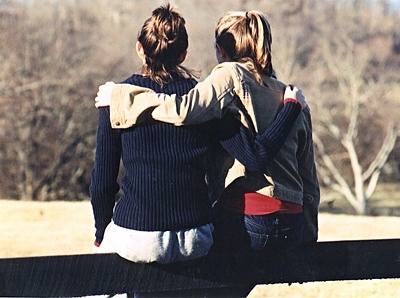 “Meet new best friends….I believe in you…” I stared in silence at the words for a while. Suddenly a light bulb switched on in my head. “Yes, Master Oliva.” I grinned. Starting from the next day, I paid extra attention to new classmates. New people interested me the most, because they were the only people I knew almost nothing about. “Who knows? Maybe one of them could become my best friend!” I muttered to myself. After identifying who seemed to be able to get along with me, I decided to approach them and converse with them once I got the opportunity to bump into them when they are alone. I wanted to attempt talking to one person a time first, because speaking to a group of unfamiliar faces was too terrifying for me. After two months of school, I had made two new friends. One of them became a closer friend and the other one a normal friend. I was proud of my accomplishment, especially because I was the one who made the first move. To me, this was a milestone in my personal development and symbolizes how I had overcome one of my fears. Later on in the year, I was also less afraid of talking to unfamiliar people in general, and gradually became closer with two of my friends who were one year older than me. I started greeting more people in the hallways as well. It was then that I realized something very important. If Olivia and my other best friends had not left, I would still be the timid Gracier who remained content with staying in her comfort zone since her best friends were always there for her. I would not have attempted to improve my socializing skills, and would not in turn have become a stronger person. Thus, I am glad my best friends left me, even though it was a painful experience. Sometimes one needs to lose something in order to gain something more valuable. I wanted to record down my memories and experience with one of my best friend who transferred away from my school two years ago.